…and don’t think for a minute that West Virginia won’t wring out more snow out of this storm. First of all, Good Thursday to all of you. I hope you guys will click over and read Rudy Ryback’s debut FirsTrax post today. Also, be sure to check out the SNOW REPORT for all of the new, natural snowfall that fell in the last 24 hours and slope openings and more. Glad to have Rudy on board for that. You can now catch his updates every weekday morning, Monday through Friday. I will handle the weekends and Holidays on FirsTrax. Beginning today, this Featured section will be just that – some featured content that I can cook up as well as featured TRIP REPORTS posted by you guys. So if you’re reading this and want to see YOUR input right here…drop me an email anytime, any day at [email protected]. Be sure to send videos, photos and more. Brad Panovich, Joe Stevens, Kenny Griffin and David McCue will also be featured here. Before I get into the SNOWY forecast, I have been getting some emails asking “why aren’t you guys doing anymore contests and giveaways anymore?” We did give away a ton of stuff last season. We gave away some lift passes, a last second vacation to Snowshoe Mountain and more. We DO have some lift passes to give away this season and I think we might even have a vacation or two or three to give away to various ski resorts this season. Bear in mind that all you have to do to be eligible to win is to SUBSCRIBE to our YouTube Channel, Like Us on Facebook, Subscribe to our Newsletters or Push Notifications, etc. (Any one of those will do…not all, haha!) All of those links are at the bottom of every post that I publish. So NOW Everyone is Talking About Us…. Here are the numbers being shared by the Blacksburg office for Beech Mountain. Snowshoe and the WV mountains could see 3-4″ of snow over the NEXT couple of days and then the same kind of snow event hinted at above. I received some emails and even read some blogs on a couple of local, pretty-well-known, weather websites that alluded to the fact that I was way, over-inflating the potential of the approaching Winter Storm Diego…before they even gave it a name! 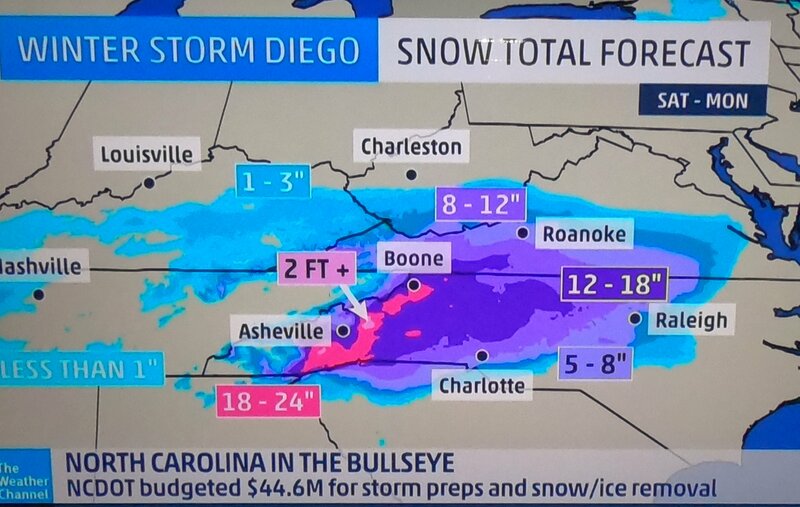 Seventy two hours later…not so much and interestingly, the local weather peeps are now also sharing that we could easily see 15″ to two feet of snow! So Let’s Talk About the BIG STORM! While I was getting ready this morning, my wife texted me the image below, which is a capture from THE WEATHER CHANNEL broadcast this morning. They were interviewing North Carolina Governor, Roy Cooper and all the while showing ResortCams.com and the King Street Camera in downtown Boone. Another friend, who lives down in the midlands of South Carolina shared that they saw us on WLTX News 19 out of Columbia last night. Earlier on Wednesday I shared that they had called the office to “join in on all the fun”. 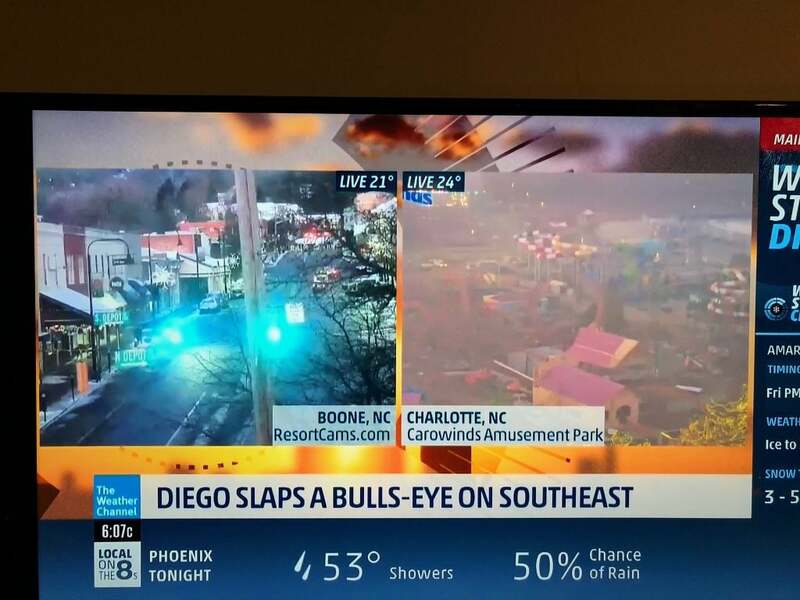 We’re really so appreciative of the symbiotic relationship that we’ve got with all of the television stations around the Southeast and mid-Atlantic. It’s safe to say that there is a ton of excitement over the approaching storm and you can watch it via all of the webcams positioned at your favorite mountain. Additionally, our newest reporter, Rudy Ryback lives within the target zone of the heaviest, forecasted snowfall and I’m certain he will be capturing video and photos. Kenny Griffin and I will be filming some as well. I will make it a point to get out and about and film some of the storm at its peak and slopeside whenever possible. Kenny and I (and possibly Rudy) have tentative plans to connect perhaps on Tuesday to do some filming and perhaps a shot at some LIVE footage as well. The visuals should be awesome when the storm clears and the sun comes out. 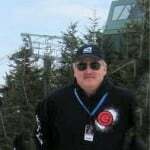 We are also expecting to hear from Meteorologist Brad Panovich with his Skier’s Forecast video. I KNOW he is stoked and we will probably get something from him tonight or Friday and then again during the storm (knowing him). Right now, the latest forecast is now pretty confident for 13-15″ of snow for most of the Western North Carolina mountains and into Virginia. Snowfall totals of 24″ or more are possible according to the latest forecast models for some locations – like Wolf Ridge Ski Resort, Asheville and Cataloochee Ski Area in Maggie Valley. They COULD see more snow than Beech Mountain although even when the predictions are for more snow in other areas – Beech always seems to wring out more snowfall. So we’ll see how this plays out. 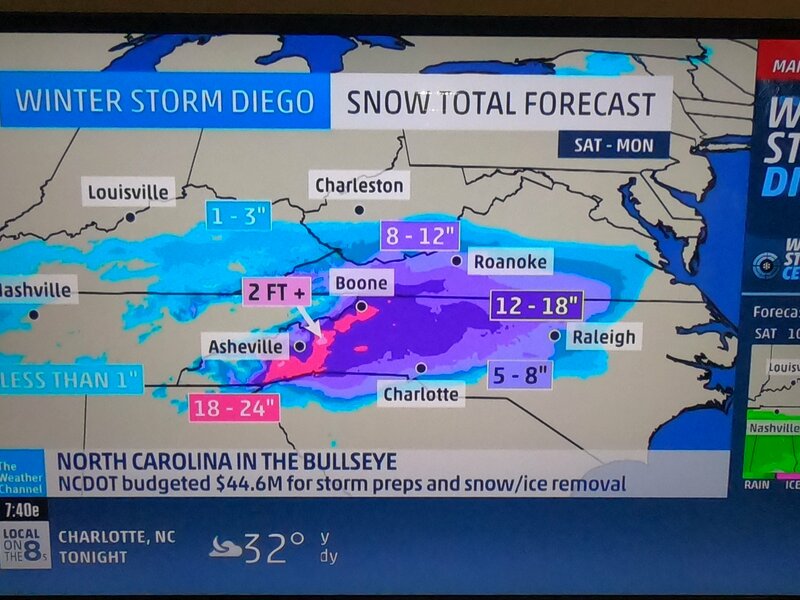 Another great resource, Pivotal Weather, has the bull’s eye over Western North Carolina and Virginia! It’s funny that with all of this talk of THE BIG SNOW, nobody is really mentioning the fact that much of the High Country – especially Beech Mountain, Boone and Blowing Rock saw 3-4″ of snow YESTERDAY! Beech is reporting 4″ in the last 24 hours, taking them to 12″ on the season! Snowshoe Mountain Resort saw ANOTHER 3″ of new snow and now stands at 24″ of snow on the season. 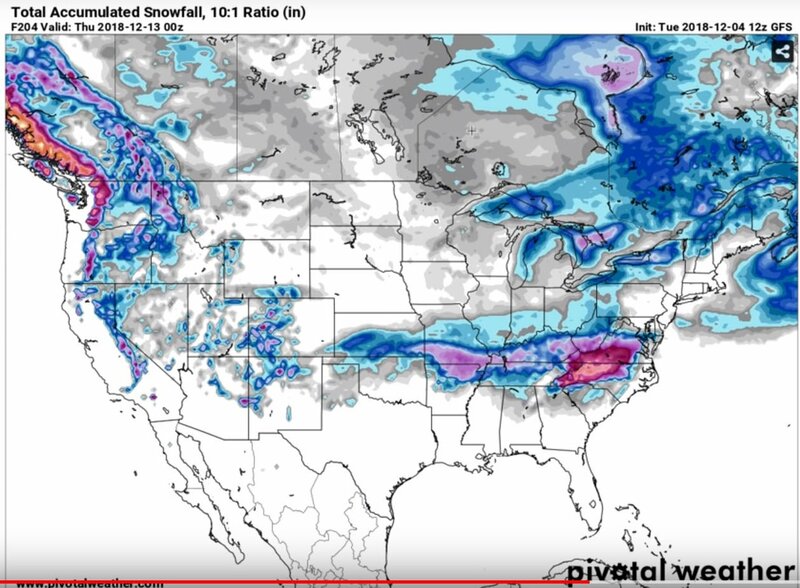 The Virginia ski areas look to be in the path of this big storm and they could get their season-numbers up in a huge way over the coming days. Snowshoe’s forecast IS for nothing but SNOW on Sunday, so look for their numbers to climb. SNOW IS ONE THING, but the temps are plenty cold as well and that means that we are in for some pristine days to be ON THE SNOW this weekend and into next week! The snow hasn’t even begun to fall, but we’ve already gotten a few emails asking about how this storm might compare with the Blizzard of 1993. Ummmm…no. However, if things hold, we could see comparable numbers to the snowstorm of 1996. That January 5th-7th storm left a three-day total of 26″ of snow across the mountains. This one COULD hit some areas with that, but the smart money is not for that to happen. I don’t know about you guys, but a foot of snow would be awesome and anything over that is just ‘snow icing’ on the cake. Bring it. We all know how these storms tend to push bands of heavy snow embedded within the main system, so we’ll see. Last night, Brad Panovich was sharing that we could see 2-3″ of moisture from this storm and with 8-10″ water-to-snow ratios…that could easily mean 15″ to 24″ of snow and more. Previous articleIt’s SNOWING at Just About Every Ski Mountain in the Region! Next articleSnowmaking was ON last night!